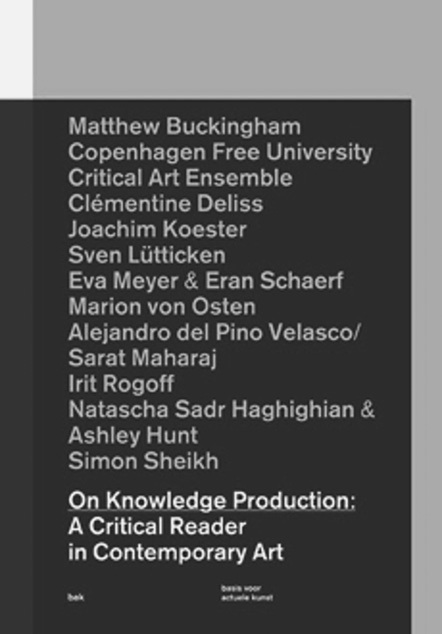 In the introduction to the publication, the editors of On Knowledge Production: A Critical Reader in Contemporary Art are quite critical of the contemporary art discourse. Maria Hlavajova, Jill Winder and Binna Choi note a ‘intellectualization’ of the art field: terms like ‘knowledge production’, ‘artistic research’ and ‘interdisciplinary practice’ have become common parlance without our knowing what they encompass. Moreover, this terminology and its dubious and unknown implications are circulating in lectures, discussions and presentations, which make them even emptier than they already are. Knowledge is merely being displayed and not analysed critically, the editors argue. The question is whether and in what way On Knowledge Production: A Critical Reader in Contemporary Art can reflect on the issue it identifies without contributing to it with the same methods. Hlavajova, Winder and Choi are conscious of their paradoxical position. Nevertheless they have collected contributions that are meant to call the status and the concept of knowledge production within contemporary art into question. Questions such as ‘What is knowledge?’, ‘What kind of knowledge are we striving for?’ and ‘With what methodologies do we approach art and the knowledge it produces?’ recur in the articles. The book is a pocket-sized anthology of new and previously published texts. It is the second publication in a ‘Critical Readers’ series published by Utrecht-based BAK. What distinguishes this reader from the hype in nebulous expressions of knowledge in art? A detailed bibliography serves to back up the facts included in the text, in fact a transcript of the voice-over for the 2003 film of the same name. On the other hand, the division into short paragraphs employed by the artist here leads the reader to think of his film. The blank lines evoke memories of the images that intervene in the text. Do they conceptually supplement the written words and in so doing redress, despite their visual absence, Buckingham’s fictional account? A striking detail is that the same text, when it was previously published in the prestigious academic journal October, (Spring 2007, no. 120, 173–181), lacked both the bibliography and the fragmented presentation. Is ‘Muhheakantuck – Everything Has a Name’ the ideal example of ‘artistic research’? Or is it being presented as such? Or does the text, in form as well as content, do what Irit Rogoff, later in the collection, describe not as the task of the artist, but of the theorist: turning over the ground on which we stand, introducing questions and uncertainties where consensus reigns? The various authors agree that institutions are largely responsible for the almost blind conformity of outlooks in art. A clear example of this omnipresent institutional co-dependence is Copenhagen Free University. This self-declared university, once founded to undermine the knowledge economy that came out of neoliberalism, wanted to subvert institutional power relations. Knowledge is not truth or property, but something ephemeral, something alive: a relationship among people. Knowledge is free. The moment Copenhagen Free University received applications from students and teachers, it had no choice, given the official status it evidently exuded, but to disband. The text in On Knowledge Production accompanies the dissolution of cfu and is a statement: We Have Won! Sven Lütticken is less radical. He is more precise and even subtle in his formulations. The parameters we use in art today are indeed dictated by the neoliberal knowledge economy, not by the discipline of art history. Artistic ‘research’, consequently, is a parody of instrumentalized academic knowledge. In his text, Lütticken focuses attention on the ‘Unknown Knowns’, the ideological subconscious in a society, repressed knowledge, the alternative, even dubious knowledge expressed in symptoms that, by definition, are unintentional, uncontrollable and unproductive. He discusses the work of artists such as Arnulf Rainer and Paul Sharits, who consciously concentrate on ‘knowledge’s other’. But Lütticken also classifies Martha Rosler’s The Semiotics of the Kitchen (1975) and Jeff Wall’s Milk (1984) under what he calls reflexive ‘symptomatology’. The author is not particularly interested in celebrating this ‘non-knowledge’ that escapes the grip of the symbol or the concept. He prefers to use the symptom to discuss technocratic knowledge production, in the process ‘revealing’ the symbol that only seemingly ‘illuminates’ and produces knowledge. Be patient and loyal, especially today, towards the symptom – that is Lütticken’s motto. The question is whether ‘everything’ that art imparts to us can be translated in terms of knowledge. No, reply Eva Meyer and Eran Schaerf. Art has its own mode and ‘says’ more than we actually know about it. A multitude of possible new relationships resonate in art, each of which gives it a new direction. Art can be compared to the dynamic speech act, in which the subject is constituted by the very act of speaking. No, replies Sarat Maharaj to the same question. A translation is never identical to its original. The ‘shadow of the untranslatable’ confronts us with what lies beyond the reach of our intellectual capabilities and cannot be approached by means of our regulated systematic knowledge. Referring to Thomas Hirschhorn's Bataille Monument (2002), exhibited in a suburb of Kassel that houses many immigrants, Maharaj argues that today it is vital, now that processes of migration are expanding, to rethink the battlefield of cultural translation, not as something unique and exotic, but as something ordinary and everyday. Awareness of the other – be it the migrant, the knowledge economy or the formal and discursive trends in art since the twentieth century (in contrast to the current ‘retinal’ visual culture) – enables us to reflect not so much on what knowledge is (knowledge production, artistic research, interdisciplinarity), but rather on how this comes into being. On Knowledge Production aims to stimulate us to explore paths that are more or less radical, but that in any case deviate from what we (are supposed to) know. Acknowledge the limits of your thinking, says Irit Rogoff. ‘It is better to do nothing than to work formally toward making visible what the West declares to exist’ is how Simon Sheikh, quoting Alain Badiou, concludes his text. He is not specific about how you can be non-productive. Sheikh’s challenging words are also the last in BAK’s Critical Reader. Should the institute have kept its mouth shut and not produced the Critical Reader, in order not to fall into the institutional trap that a book in fact represents? On Knowledge Production does not aim to provide answers, but to provide a spectrum of conceptual experiments and cautious proposals. Although the writers, in the formulation of their visions, scarcely step beyond the ‘obscure’ discourse of art, the diversity of art theory texts testifies to the intentions of Hlavajova, Winder and Choi. Awareness of the dominant terminology and its implications is activated ‘otherwise’ in On Knowledge Production. bak’s Critical Reader stimulates debate on this, even if on occasion it comes off as a little forced.